Easter Day symbolizes the passion and death of Jesus Christ. A series of great day begins with the celebration of White Thursday, Good Friday, and Quiet Saturday then the Easter Sunday evidences as the celebration of the resurrection of Jesus. There is one unique thing that has always been synonymous with this great celebration, the Easter Egg. Lets get to know about Russian Easter Eggs. Christians in many countries, include Russia, must always do the tradition of decorating and looking for Easter eggs. This activity is done by all Christians, especially children and young people. This tradition has been done for centuries and is a part of cultural history. In Eastern and Orthodox Catholic Churches, Easter eggs are decorated with the red color that symbolized the blood of Jesus during the crucifixion. The eggshell is the symbol of the tomb of Jesus. The breaking of the eggshell implies the resurrection of Jesus from the dead. On a quiet Saturday, Easter eggs are blessed and distributed to the people. Christ’s Resurrection. The meaning of the Easter egg is to affirm the Resurrection of Jesus Christ. As Christ rose from the dead and came out of the grave (round-shaped). Likewise from within the egg appears a live chick. New life. Eggs become a symbol of new life. This is because the egg is the embryo of an animal. When the chicken comes out of the eggshell, the chicken’s life begins. Cheerful Sacrifice. This cheerful sacrifice practiced by the parents when giving up chicken eggs was given to the children as Easter gifts. Parents are willing to decorate Easter eggs beautifully to give to their children. Some people even give Easter eggs to others. Recovery. In a country with 4 seasons, eggs are a symbol of the freezing winter turn to spring. Easter eggs mean a restoration for people who have a cold, bitterness, or grief. Love is warmed to enjoy the beauty of life, grow and flower the plants. 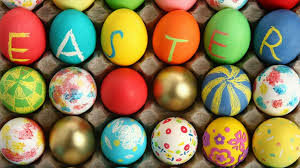 Currently, Easter eggs are stained with paint or markers. Initially, the eggs are stained with natural dyes. For the eggshell part of the brown, usually boiled with red onion skin. The color of the black shell is obtained from the process of boiling eggs with oak bark, or walnut skin. Eggs are also usually displayed in gold, how to boil it with the skin of young apple trees or calendula flowers. Displays a purplish color, boiled eggs along with a malva flower crown. Colors can turn green if boiled with rye. To make it pink, the egg is boiled with red beetroot. There is a traditional game of throwing Easter eggs. The trick is by requiring each participant to throw the egg of another participant with his own egg. The winners are those whose eggs are the most intact at the end of the race. This tradition or game is in England, Germany and other countries. The children race to drop the eggs by rolling down the cliff. Each participant is asked to lay eggs on the floor and dance in between. They are required to be able to dance with passion and well without stepping on an egg. Ornamental eggs are not only used for Easter celebration. Iranians usually wear ornamental eggs in celebrating Nowruz or the new year, as a sign of the first day of spring based on the Persian calendar. The presence of eggs in this celebration becomes a symbol of fertility.